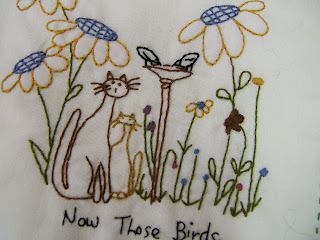 It's been a while since I've been here - but that's not to say I haven't been stitching. 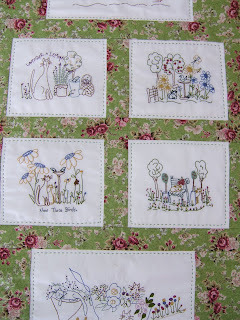 A couple of weeks ago I finally got round to putting all these gorgeous little stitcheries, from Barb's Cat Club, into a wall-hanging, so that I could enjoy looking at them instead of seeing them 'resting' in a little pile on the shelf. Really happy with the end result, too! Here's a close up of each of them..
Have also been doing some other bits - like this Christmas stocking - it's Marg Low's new pattern, and comes with this stitched version and also a strip pieced version which is the one we are going to do in the Christmas Club classes. And then there are the Gingham Girls - this is part of block four..
...and hopefully this, along with the stocking, will be finished off this weekend. Depends on the weather! 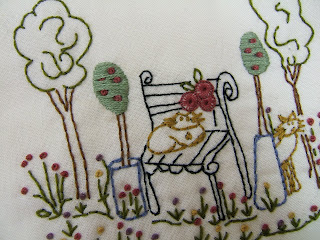 Here's Debbie's last block of her Kitten's Tale - so cute! 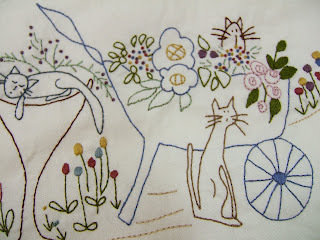 I have a feeling that she will be bring the completed top to stitching group today - can't wait to see it. 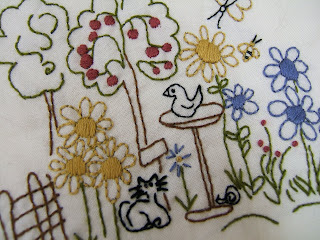 And this is her most recent Breast of Friends block, and I think it just might be my favourite - so very pretty! Well, I have to confess that this blog entry has been an absolute mission to complete - I have absolutely no idea what has happened since I last did an entry but it seems a whole lot of settings or something have changed. It has taken me three attempts to get to this point and I will be almost surprised if it publishes. I hope that you are all enjoying the slightly lightly evenings, the not so chilly mornings and just how many blossom trees have you seen in flower! All of your work ist pretty, great! Wow, Jenny, I am totally impressed by all the loveliness you made! Your wallhanging is a beauty. 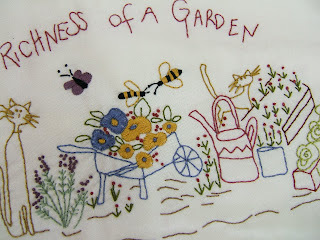 I love the stitcheries to it. So cute!! !